We invite you to explore a world of plants year round. Let us nurture your curiosity, creativity and discovery by helping you find fun things you can do on your visit to the U.S. Botanic Garden or in your very own home. Check out our upcoming programs to see if there's something special happening during your visit. While at the Conservatory, enjoy our living classroom with your family! Take a trek through the wilds of the U.S. Botanic Garden to discover the amazing world of plants. Embark on an expedition through the Conservatory recording your observations and completing activities using our resources below. 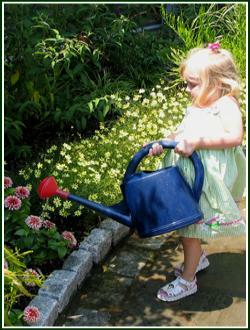 To continue your plant explorations, check out these At-Home Activities. Using this passport, students explore our Conservatory to find seven different plants and learn about plant parts and function. This resource is great for our younger visitors. Allow 30 to 45 minutes for this activity. Find the passports at the front information desk. Passports are not available during the Season's Greenings holiday show. Look for the holiday plant hunt instead. Using the backpack and adventure sheets, students work in teams to explore each room of our Conservatory. This free resource is designed for third through sixth grade students. Junior Botanist Adventure Kits are available for checkout at the front information desk. Backpacks are not available during the Season's Greenings holiday show. Look for the holiday plant hunt instead. Using this guide, students explore the Conservatory and learn about the U.S. Exploring Expedition (1838-42) during which scientists collected both living plants and pressed specimens and discover plants from around the world to include three plants descended from the Expedition. This resource is recommended for readers of all ages. Allow 45 minutes to one hour for this activity. Find the field journals at the front information desk. Using this passport, students explore our Conservatory to learn where many of our foods come from and discover which part of the plants we eat. This is a great resource for our younger visitors. Allow 30 - 45 minutes for this activity. Find the passports at the front information desk. Passports are not available during the Season's Greenings holiday show. Look for the holiday plant hunt instead. This curriculum includes a teacher journal and student journals that explore four Big Ideas -A Puzzle of Plant Parts, Plant Multiplication, Surviving Against the Odds, and Are Plants Like Us. This resource is available only by download. Allow 30-45 minutes for each Big Idea. Using this field journal, students explore our native plant collection in our outdoor Regional Garden. This journal encourages students to learn about native plants and observe plants in different seasons. Allow 30 to 45 minutes for this activity. Find the field journals at the front information desk.